We all love karting, right? The fight over the fastest kart (there usually is one), learning a new track, a bit of friendly bumping of slower karts… it’s all good fun. 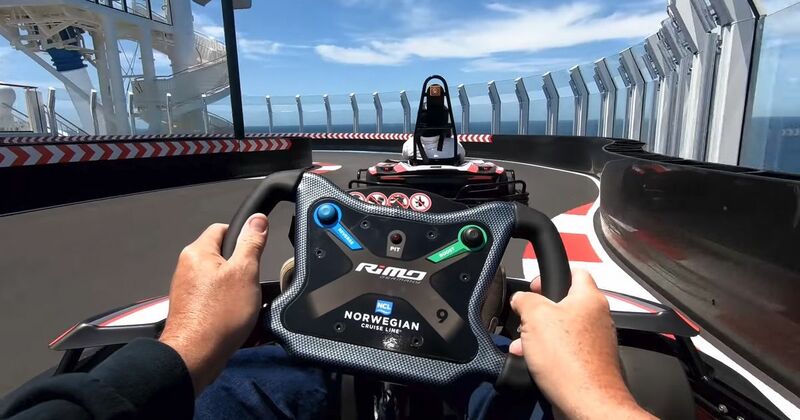 Well, now you can partake of a little go-karting action on the top deck of a new cruise ship called Norwegian Bliss. The two-level track is the first of its kind ever to be built on a ship, and is 40 per cent longer than the one on Bliss’ sister ship, Norwegian Joy. The karts are electric and can apparently reach as much as 30mph. Barriers should stop anyone going all Hollywood and crashing overboard into the Pacific, although we can’t deny it’s a pretty rock n’ roll mental image. Speeds are remotely limited at first, while everyone gets used to the karts. It costs $9.95 for just eight laps around the almost multi-storey car park-esque circuit, so it’s not exactly cheap compared to land-locked tracks. On the other hand, the views alone make it a key experience for anyone travelling on the boat. Based in North America, out of Seattle in the summer months, the five-engine Breakaway Plus-class ship sails to Alaska. In the winter, it switches coasts to run routes to the Bahamas, Florida and elsewhere in the Caribbean.